BENEDICT II, eighty-first Pope of Rome, during his education, St. Benedict excelled at singing, and was a noted Bible scholar. Elected in 683, St. Benedict’s enthronement took place almost a year later, as the election of Popes required Imperial confirmation. During his papacy, St. Benedict fought against Monothelitism, helped bishops in Spain restore orthodoxy in their diocese, and was able to secure Emperor Constantine Pogonatus’ consent to do away with the requirement of Imperial confirmation of his successors. St. Benedict reposed 685, and was buried in St. Peter’s Basilica in Rome. BONIFACE IV, a student of St. Gregory the Dialogist (3rd September), monk at the Abbey of St. Sebastian in Rome, and deacon to St. Gregory the Dialogist, St. Boniface became the sixty-seventh Pope of Rome on 25th August, 608. As Pope, he oversaw the first conversion in Rome of a pagan temple into a church, supported the evangelisation of England, and promoted reforms amongst the clergy coupled with improved living and working conditions. Towards the end of his life, St. Boniface converted his home into a monastery, where he then lived balancing his time between papal responsibilities, and monastic life. St. Boniface reposed 8th May, 615 and was at Old St. Peter’s Basilica. DESIDERATUS (DÉSIRÉ), the twenty-third Bishop of Bourges in Aquitaine. A courtier to Clotaire I King of the Franks (r. 551 - 558), who fought against both simony and Nestorianism, and though his desire was to retire to monastic life, St. Desideratus was chosen to serve as Bishop of Bourges in 541. During his time as Bishop he attended both the fifth Council of Orleans (549). St. Desideratus reposed in 550. DIONYSIUS (DENIS), (Second Century), the sixth Bishop of Vienne in the Dauphiné. According to St. Ado (16th December) a ninth century Bishop of Vienne and noted martyrologist, St. Dionysius was one of the ten missionaries who accompanied St. Peregrinus (16th May) to evangelise Gaul. GIBRIAN, an Irishman who, along with his five brothers and three sisters, went to Reims, where he was blessed by St. Remigius to live as a hermit at a location that is now called Saint-Gibrian after him. St. Gibrian reposed circa 515. HELLADIUS of AUXERRE, the third Bishop of Auxerre, St. Helladius served that See for thirty years. He reposed 387, and was succeeded by St. Amator (1st May), whom St. Helladius brought to Christ. IDA (ITA, IDUBERGA) of NIVELLES, following the repose of her husband, St. Pepin of Landen (21st February), St. Ida built the double monastery at Nivelles that later was known as the Abbey of St. Gertrude, after St. Ida’s daughter and first Abbess. St. Ida spent the rest of her at Nivelles Abbey, reposing 652. ODRIAN, (Date Unknown), an early Bishop of Waterford, and patron saint of Waterford as well. No further information, including the dates he lived, about this saint exists. VICTOR the MOOR (MAURUS), a soldier in the Roman Praetorian Guard originally from Roman Mauretania, and a Christian from youth. 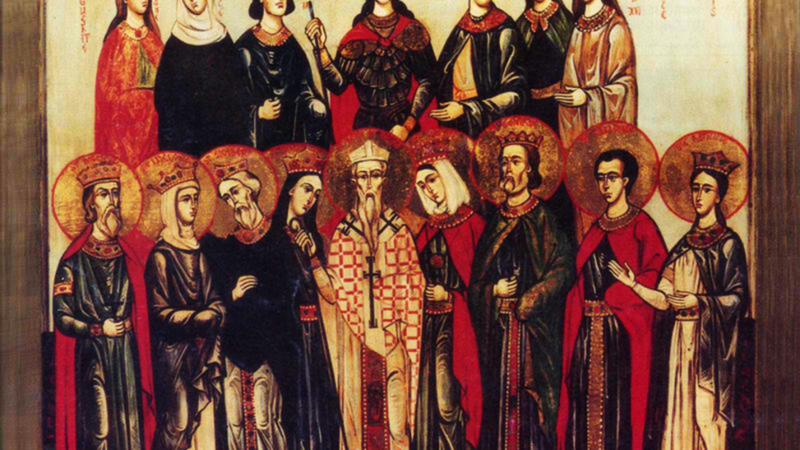 St. Victor managed to live to an old age before being persecuted for his faith. St. Victor was arrested, circa 303, tortured by being basted in molten lead, and then beheaded. WIRO, PLECHELM, and OTGER, St. Waro was the second Bishop of Utrecht in Frisia. St. Wiro, with two companions, SS. Plechelm and Otger founded a monastery at on a hill above present-day Sint Odiliënberg in the Netherlands. St. Wiro reposed circa 753.